These are Times least expensive pedal set. They are also discontinued for good reason and are included here so the origin of the TMT is clear. They are the TWT style permitting clipless pedaling on a bike and a recessed cleat while taking a break and walking with your cleats still on. The body is cast of grey plastic and uses the steel spindle and bearing assembly common to most Time pedals as explained above. The cast rear plastic cover over the spring bar has reflective tape to permit rear visibility at night. The shoe sole rests 20mm over the spindle and the pedal permits 34 degree of lean before pedal to ground contact. The cleat breaks away with a 20 degree outward release angle or a 25 degree inward release angle. The Action pedal is light Grey with dark Grey accents, and weighs 389 grams per pair without cleats and mounting hardware. The brass cleats and mounting hardware weigh 75 grams. The Century TWT pedals are cast in the same shape as the Action pedals but done of carbon reinforced plastic. The differences between the two, apart from material, are largely cosmetic. The aluminum casting holding down the front D-ring is painted glossy Black. The body itself is painted a dark metallic Grey and the cast plastic rear spring cover is Black with a clear reflector installed for nighttime visibility. The shoe sole rests 20mm over the spindle and the pedal permits 34 degrees of bike lean, before your pedal scrapes the ground. The cleat breaks away with a 20 degrees outward release angle or a 25 degrees inward release angle. 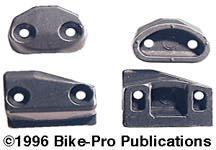 The Century pedals weigh 393 grams per pair without cleats and mounting hardware. The brass cleats and mounting hardware weigh 75 grams. 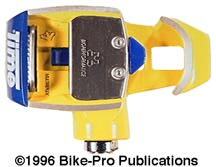 These are also discontinued but use a style of cleat retention similar to the TMT pedals. There was a reason that the TWT pedals were discontinued, it may become the same reason that TMT pedals are discontinued. 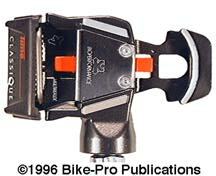 The Time Sport pedals are the entry level model of Time's TBT style racing pedals. The body is made of cast aluminum alloy with the outer side of the toe distinctively closed, though it in no way interferes with the pedals release operation. The spindle and bearings are the same as those used throughout the Time line. 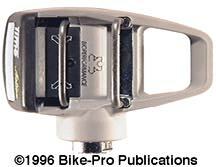 The Racing Clip on the Sport pedal is made of Yellow plastic; there is a stainless steel cover over the middle section of the pedals to prevent the cleats from scratching and gouging the aluminum body. The plate is fastened by two T-10 Torx machine screws. The bar spring is closed under a Grey plastic pivoting cover. The shoe sole rests 13mm over the spindle. 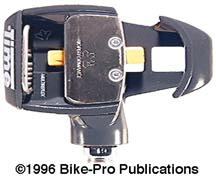 The pedal permits 33 degrees of bike lean before pedal to ground contact. The cleat releases with the shoe turned at a 20 degree outward angle. The Sport pedal is dark glossy Grey with matching accents, and weighs 479 grams per pair without cleats and mounting hardware. The brass cleats and mounting hardware weigh 102 grams. No longer made, we sold these for $139.99 a pair. The shape of the Criterium pedal is largely the same as the Sport but is made in a different mold. The body is forged as a single piece from aluminum alloy, painted in a glossy Yellow color and then has upper surface milled leaving Silver accents. 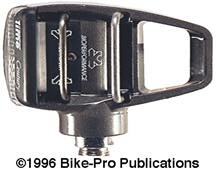 The Criterium pedal uses the same spindle and bearing assembly found in most Time pedals and is described in the Time overview. The toe portion of the body is cast with outer toe closed like the Sport, and doesn't interfere with the release system, (though it has an elegant look). The Racing Clip on the Criterium is cast of Blue plastic, with a stainless steel plate covering the aluminum between the cleats to prevent damage to the pedal surface. 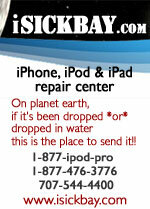 The rear cover over the spring bar pivots back and is made of Blue plastic. The shoe sole rests 13mm over the spindle and the pedal permits 35 degrees of lean before pedal to ground contact. The cleat releases with the shoe turned at a 20 degree outward angle. The Criterium pedals weighs 480 grams per pair without cleats and mounting hardware. The brass cleats and hardware weigh 102 grams. No longer made, we sold these for $184.99 a pair. The Classique introduces the pricey models of the Time road pedals. The Classique body is forged as a single aluminum alloy in the style Time made famous, unfortunately they have been discontinued. The body is painted a dark metallic Grey with a milled top surface that leaves Silver accents. This pedal uses the steel spindle and bearings common to all but one of Time pedal sets and there is a deeper description in the overview. The Racing Clip is made of Red plastic and a stainless steel plate straddles the aluminum body to prevent damage from the cleats to the surface. The rear cover over the spring bar pivots back and is made of matching Grey plastic. The shoe sole rests just 9.5mm over the spindle and the pedal permits 31 degrees of bike lean before pedal to ground contact. The cleat releases with the shoe turned at a 20¡ outward angle. 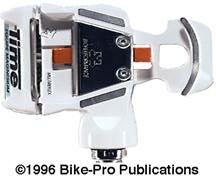 The Classique pedals weigh 475 grams per pair without cleats and mounting hardware. The brass cleats and hardware weigh 102 grams. 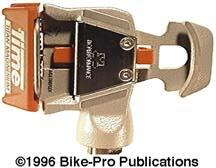 There is a new model of this pedal released for the 1994 model year. The delivery from Europe of these pedals arrived late and the few that arrived were provided to sponsored riders. We will review the new Equipe Pro Titanium Magnesium in edition 2 of the Buyers Guide. What follows is the review of the earlier model that you are more likely to see at bike stores now. The Titan Magnesium represents the ultimate Time pedal and is used by several people on staff. It is cast in the same shape as the previous two pedals and like the Equipe the body, is cast of magnesium alloy. The body is painted in a glossy light Silver color with milling to the top surface leaving Silver accents. The spindle for the Titan Magnesium pedal is made of Titanium 6Al-4V alloy that is turned on a lathe from rod stock, with cuts for pedal wrench grips, threads for the cranks. The threaded end is drilled and broached making a 6mm hex fitting to hasten installation. Though the spindle material is Titanium, the piece is an identical copy of the steel one used in all other Time pedals. Time, therefore uses the same bearing, cir-clip, and dust seal with this spindle that are in the other pedals. The use of the Titanium spindle cuts 27 grams off the weight per spindle. The Racing Clip and the rear cover over the spring are made of Red plastic; the Titan has the stainless steel cover that straddles the cleat connecting points to protect the pedal's surface. The shoe sole rests just 9.5mm over the spindle and the pedal permits 31 degrees of bike lean before pedal to ground contact. The cleat releases with the shoe turned at a 20 degrees outward angle. The Titan Magnesium pedals weigh 351 grams per pair without cleats and mounting hardware. Time reworked the mounting hardware for this pedal set by making the rear cam of aluminum instead of the much heavier brass. The front cleats in all the other TBT sets are Silver aluminum; for this set both the front cleat and rear cam have been anodized Black and have matching black fastening bolts. The aluminum cleats and hardware weigh 53 grams. No longer made, we sold these for $294.99 a pair.